When the unforeseen strikes a DPS family, the Foundation is ready with financial resources and assistance to help overcome hardships. 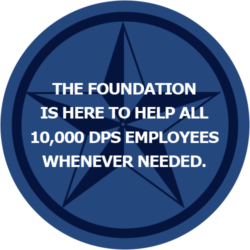 The Foundation provides scholarships for degree programs and career advancement to DPS employees and their children. Your contributions kickstart major DPS Foundation initiatives: memorial projects, financial literacy, resiliency training and more. Over $140,000 in educational scholarships awarded to DPS families. Lodging for families to be with Troopers injured in the line of duty. Awards recognized DPS employees for valor and length of service. Dedication of Texas highways to Troopers killed in the line of duty.